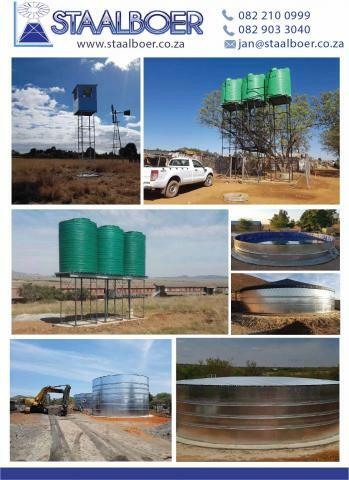 Staalboer is a Proudly South African company manufacturing steel panel reservoirs with capacities ranging from 15 000l to 4 000 000l and heights ranging from 1,3m to 4,9m. The structures are fully galvanized and have a life expectancy in excess of 20 years. 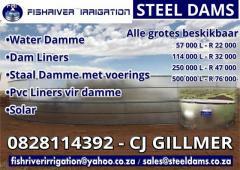 Our dams are made from flat steel panels with stiffening rings at the top and bottom and in between as necessary. Our reservoirs are made from Z275 galvanized steel sheets and hot dipped galvanized tubing. All bolts and nuts are galvanized. The structure carries a 10 year warranty against faulty material and/or workmanship. Our water tank stands are manufactured according to engineering specifications and are supplied in kit form for easy transportation. The platform is galvanised on all stands and complies with all major tank manufacturers. Our guard towers are fully galvanised and supplied in kit form to ensure countrywide distribution. The towers are available in heights ranging from 1.5m up to 12. The structure includes a gang ladder.